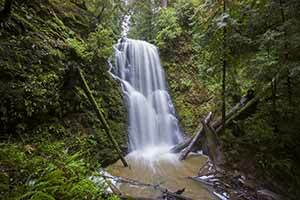 The Basin Trail loop is one of the best all-day hikes in the Santa Cruz Mountains and is a good, less-crowded alternative to the Berry Creek Falls loop. 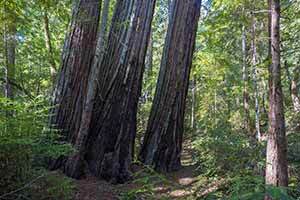 The old-growth redwoods might not be as impressive as Berry Creek Falls, but the trail has a quiet, remote feel and gives a satisfying sense of having traveled somewhere. 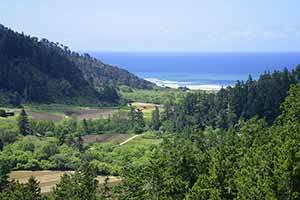 Circling around the rim of Big Basin, the hike passes through a variety of different woodlands and some sunny coastal scrub. 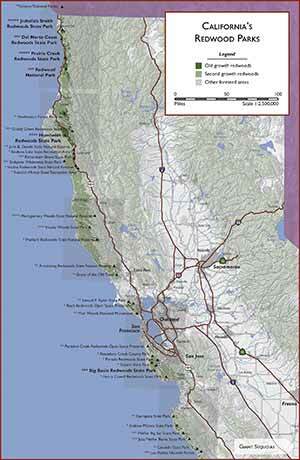 There are redwoods along most of the route, although the redwoods are sparse at the higher elevations. 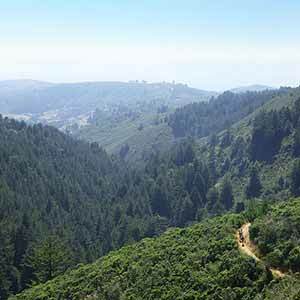 The highlights of the hike are a series of superb views over the basin and an especially enjoyable descent into a redwood-filled canyon. The woodlands are at their best in the winter and spring and can get a bit dry-looking by the end of summer. This is an ideal loop for a fine sunny day; avoid it when it’s overcast, since the woods can get dismal and uninteresting. The trail is lightly used but is usually in good condition. Start at park headquarters. Cross Opal Creek on the bridge across from the museum and snack shop to reach the Skyline-to-the-Sea Trail, then turn right. After an all-too-short walk under the superb old-growth redwood lowlands along Opal Creek, turn left onto the Dool Trail. 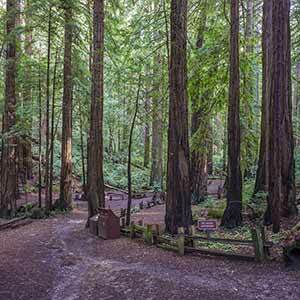 Continue straight at the next few intersections as the Dool Trail climbs through a redwood-filled ravine. 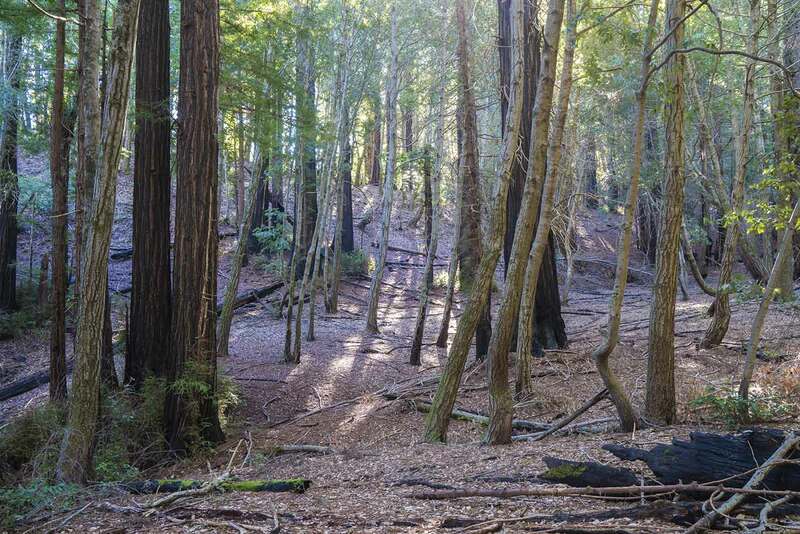 The redwoods generally get smaller as the trail climbs, but as the trail approaches Middle Ridge Fire Road, it enters an attractive ridgetop redwood grove. Turn right onto Middle Ridge Fire Road and continue climbing. The trail breaks out into a sunny clearing covered with sparse chaparral and a few pine trees. Look for a overgrown path to the right that leads a few yards up a small rocky knoll with the overly grandiose name of Ocean View Summit. 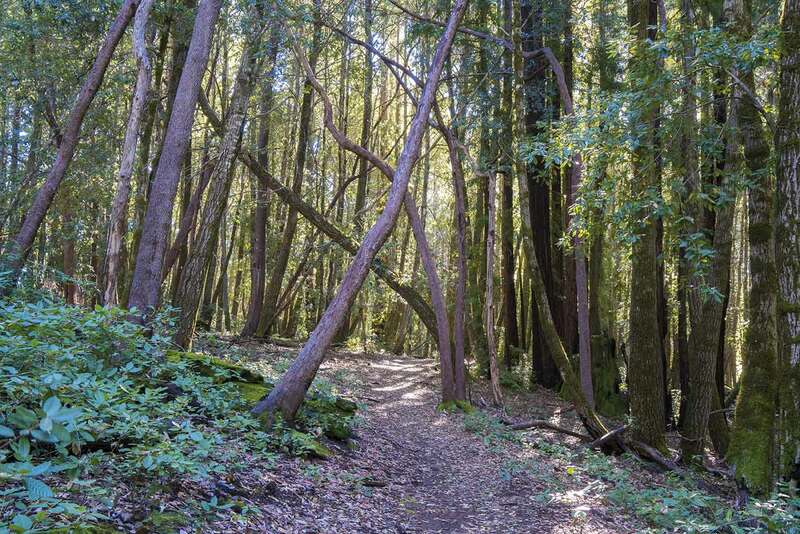 The brushy trail leads to partially-obscured views of the verdent redwood-carpeted hills and, perhaps, a glimpse of the ocean in the distance. A lot of visitors just do an out-and-back hike to this point. 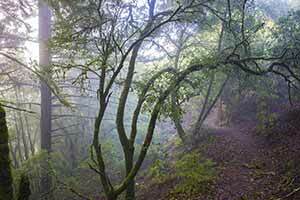 After the summit, the fire road resumes climbing and soon enters a dense redwood grove. 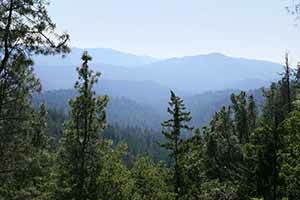 The redwoods are old growth, although in this upland environment there aren’t any really huge trees. In addition, the woods start transitioning to a drier, more open look without any of the usual dense huckleberry groundcover. The fire road descends to the Meteor Trail intersection, then climbs steeply past more redwoods. After reaching its high point, the road descends slightly to reach an intersection with Hollow Tree connector trail to your right. Turn left at the first intersection. The trail is marked as the "Lane-Sunset Rim Trail" on the signpost but it’s actually the Hollow Tree Trail. 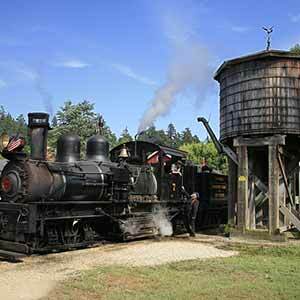 The trail climbs steeply past the Johansen Shingle Mill, which has been reduced to a collection of rusted-up equipment in a dismal, logged forest. The trail then levels off and winds around ravines for quite a long time. The forest, which is still rather dry-looking, mostly consists of tanoak with no groundcover at all. 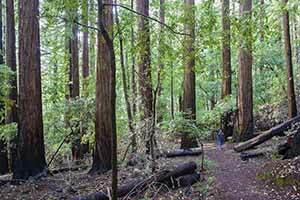 Surprisingly, though, there are occasional large and fire-blackened redwoods in this area. 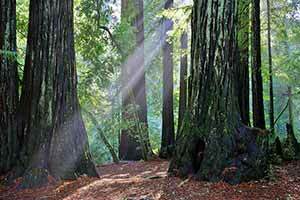 At one point, if you look carefully through the canopy, you can see two redwoods towering high above the other trees. 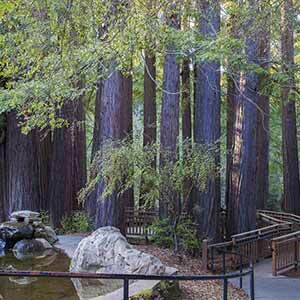 Further along, you’ll pass by the base of these redwoods, which turn out to be a huge double-trunked tree. 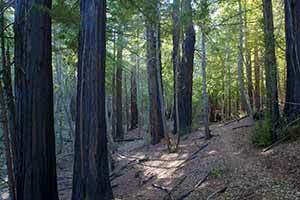 The trail also passes through a small grove of old redwoods in a small depression, dry and fire-blackened. At the Lane Trail Camp, turn right onto the Basin Trail and descend through the woods. 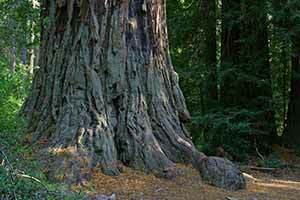 The redwoods here are much smaller. The trail climbs a bit before emerging into sunny chaparral. 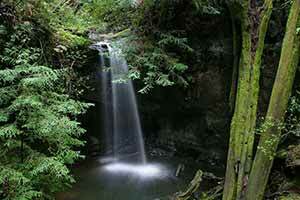 There’s a brief glimpse, partially screened by pine trees, down the entire length of the Opal Creek valley. 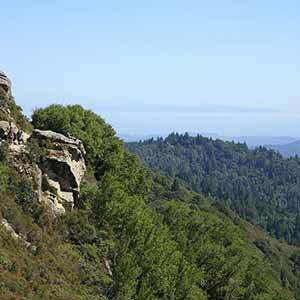 The trail curves right at a rock outcropping, then reaches a second, larger outcropping with a panoramic view of redwood-carpeted ridges cascading off into the blue distance. Amazingly, you’re only halfway into the hike at this point, but the rest of the hike is almost all downhill. The trail continues through tall chapparral and mixed woods with a few tree-screened glimpses of rolling hills. This part of the trail can get a bit overgrown; there’s also a little poison oak to watch out for. 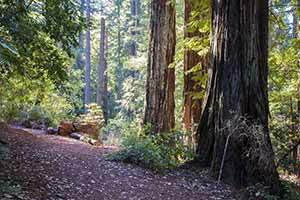 Entering a refreshingly cool and shady redwood grove, the trail climbs slightly and crests a low ridge, then descends through chaparral to an intersection with the Skyline-to-the-Sea Trail. Turn right and continue descending, passing several fine views. Throughout this stretch of the hike, cars and motorcycles can sometimes be heard on China Grade Road, which runs just above the Basin Trail, and Route 237, which is not visible but is only a few hundred yards below the trail. 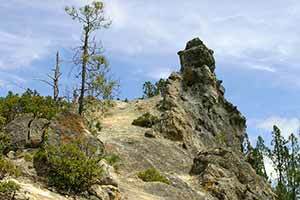 The trail levels out and passes through sparse chaparral, crossing several rock outcroppings and running along a surprisingly sharp ridge before beginning a steep descent into a redwood-filled canyon. 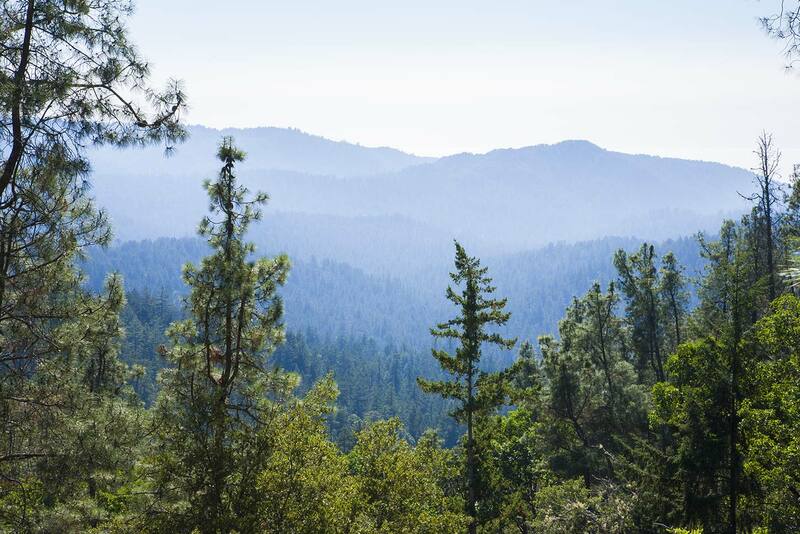 The dark old-growth redwood grove, with its huge trees rising high on the hillsides above the burbling creek, is the finest in the upper Opal Creek area and makes a striking contrast with the bright, sunny chaparral and panoramic views from just a few minutes ago. The grove has a really dense understory of tanoak (which is probably the result of fire suppression) but mostly lacks groundcover. The trail climbs over a low ridge and crosses another creek before joining the Hollow Tree Trail. 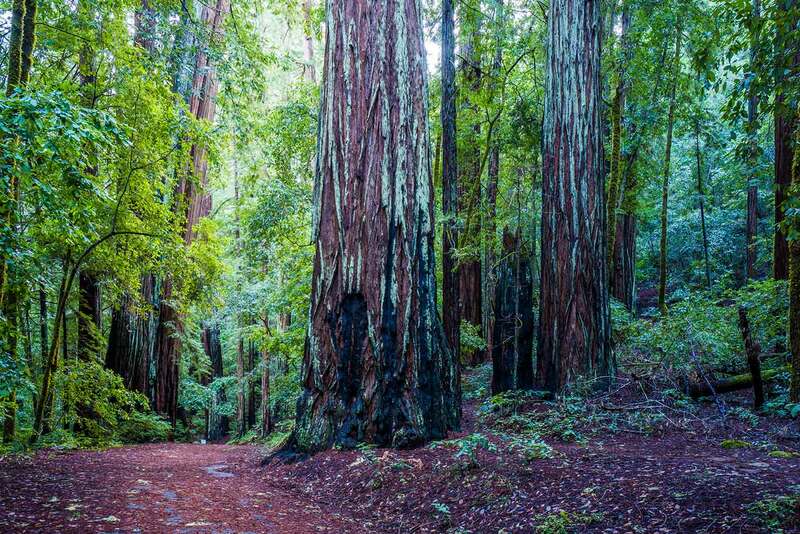 The redwoods get smaller after the initial descent, but it’s still an extraordinary forest. As you walk along the creek you’re enveloped by remarkably rich green foliage that rises high above you. Late on a summer day the woods are lit up by the golden late-afternoon sunshine, making this stretch extra scenic. Opal Creek burbles next to the trail. The trail ends at the paved North Escape Road, which was built in 1935 to allow campers to escape the park in case of a forest fire. Turn right and cross an auto bridge. 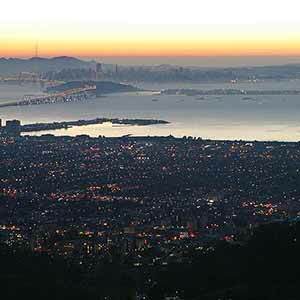 The Skyline-to-the-Sea Trail resumes to your right, but it’s easier and more scenic to just stay on the road. 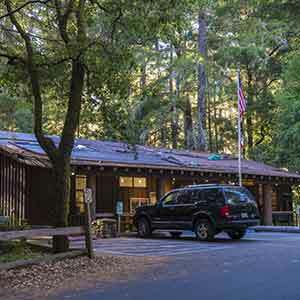 The shady road, covered with redwood needles, alternates between old growth and second growth forest but is pleasant throughout. 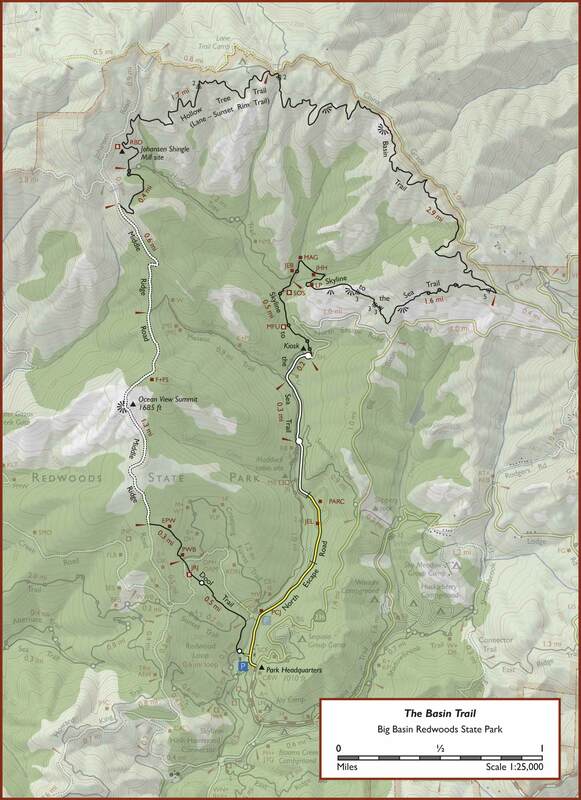 After the intersection with the Sequoia Trail, the woods improve and the road passes some now-closed campgrounds and day use areas. 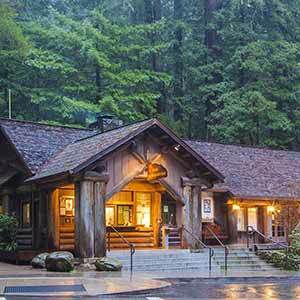 The redwoods get progressively more impressive as you approach the Visitor Center, culminating in the roadside Stanford Group.